As a Lieutenant and 13 year veteran with the Oakland Fire Department, Damon understands the role that CPR plays in saving lives. As a seasoned Paramedic he has real life experience to share with his students that is always infused with a dose of humor and humility. As a 20 year veteran Captain in the Oakland Fire Department, Leon has an abundance of real life experience to share with his students. As a certified American Heart Association CPR instructor he's always insightful and funny. A class with Captain Primas is one you will never forget. Our friendly and experienced staff of training professionals serve every region of the San Francisco Bay Area. With flexible scheduling, we do our best to accommodate your time and your needs. Please take a moment to read more about each staff member. 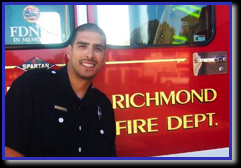 Eric Govan is an EMT-Fire Fighter for the city of Richmond and a certified American Heart Association CPR instructor. As a Spanish speaking Instructor, he brings over five years of real life experience to the classroom setting. As a member of the Richmond Fire Department Eric has always gone the extra mile to help his students understand and learn the impact that CPR can have on saving lives.